Welcome to the mother of all home renovation challenges: the bathroom. Potential DIYers and home sprucer-uppers are often filled with dread when considering this difficult task. It can be a doozy, but take a deep breath. Our guide will walk you through the steps necessary to solving your bathroom woes. And if doing it yourself seems like too monumental a task, we’ve also got the tips to finding someone to help you do it. Without further ado: Engage Operation Bathroom Remodel. Before you start, you need to determine what your remodel will entail. Are you going to redo the entire thing, or just replace a toilet or some fixtures? This is crucial, as you don’t just want to take a sledgehammer to the whole thing HGTV style. Do some research to see what’s required when doing things like laying down tile, replacing a bathtub, or removing a toilet. This Old House is a great resource for finding out what a particular job is going to take and how much it could cost. Depending on what you’re going to do, you might need some serious tools. Figure out if you’re going to need tile cutters, large sanders, grinders, or any other tools you might not currently own. You don’t have to buy everything. Many times, your local hardware store has plenty of tools for rent, and for very affordable prices. Then find as many of the materials as you can. Look for discounts, and don’t forget to check Craigslist. Many times you can find extra materials for free or very low prices. 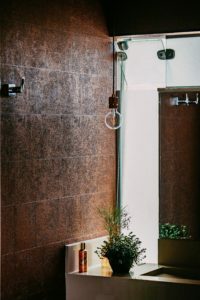 Make sure you pick the right types of things, too — from grout to tile, poor planning can lead to some big, costly mistakes. When in doubt, call for help! Now that you’re ready, you can get to work. Easy! But if you’re not feeling confident in the DIY route, get in touch with a qualified contractor. Like window replacement, it’s important to shop around for multiple bids, as well as checking references. Some contractors might even offer a discount if you provide the materials. Once it’s all said and done, you should have a grand old replacement bathroom. If you’d like to move on to a larger or more modern home, contact us and we can get you started on the journey. And don’t forget to share photos of your bathroom remodel with us on Twitter and Facebook!